For 30 years, Biotech Dental has been a leading innovative company in the dental business and has become known for quality dental implants. Philippe Veran, Founder and President of Biotech Dental, invested 10% of the company turnover to help Biotech become a leader in Additive Manufacturing. Biotech Dental is the only company in the world that manufactures 100% of their dental prostheses using digital workflows and Additive Manufacturing coupled with other manufacturing processes like milling. Biotech Dental has developed complete digital workflows to help dentists and labs quickly scan files to Biotech’s manufacturing centers. 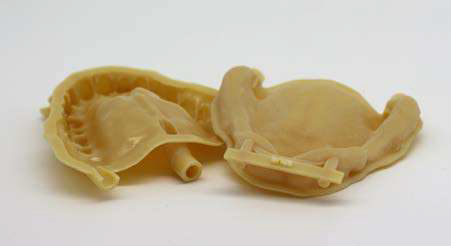 Designing a removable prosthesis presents issues regarding the different materials (e.g., resins, metals, composites) that cannot be printed in the same machine and that might compromise the final quality. Therefore, Biotech Dental developed and patented a new process to improve dental prosthetics digitalization. 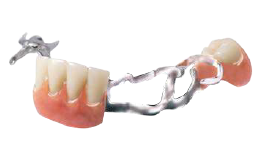 Before the innovation, it was impossible to produce and design partial removable prostheses, such as teeth and gingiva. It took three hours for labs and four appointments for dentists to conceive the types of parts they needed, including standard shapes for teeth. This process includes the automatic design and printing of a two-part mold to house a metal framework and a composite printed set of teeth. The two-part mold is closed and the resin is injected and baked. Once finished, the part extracted from the mold is polished and the prosthesis is ready. For labs, this process requires five to 10 minutes of design and two short appointments for dentists. Biotech Dental has been using 3D printing technologies for more than 10 years. Prior to using HP MJF technology, the company used an SLS machine, but HP MJF increased the production rate by nearly four times the original rate and reduced costs by 78%.